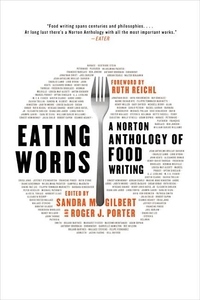 Edited by influential literary critic Sandra M. Gilbert and award-winning restaurant critic and professor of English Roger Porter, Eating Words gathers food writing of literary distinction and vast historical sweep into one groundbreaking volume. Beginning with the taboos of the Old Testament and the tastes of ancient Rome, and including travel essays, polemics, memoirs, and poems, the book is divided into sections such as "Food Writing Through History," "At the Family Hearth," "Hunger Games: The Delight and Dread of Eating," "Kitchen Practices," and "Food Politics." Selections from writings by Julia Child, Anthony Bourdain, Bill Buford, Michael Pollan, Molly O'Neill, Calvin Trillin, and Adam Gopnik, along with works by authors not usually associated with gastronomy--Maxine Hong Kingston, Henry Louis Gates Jr., Hemingway, Chekhov, and David Foster Wallace--enliven and enrich this comprehensive anthology. "We are living in the golden age of food writing," proclaims Ruth Reichl in her preface to this savory banquet of literature, a must-have for any food lover. Eating Words shows how right she is.